Kidd is a bespoke, hand-built, custom 22-foot gentleman's racer. The boat is powered by a forceful V-8 inboard and shows thousands of hours in craftmanship. She turns heads when people see her. This gentleman's racer turns heads whenever people see her. All boats are a series of curves. 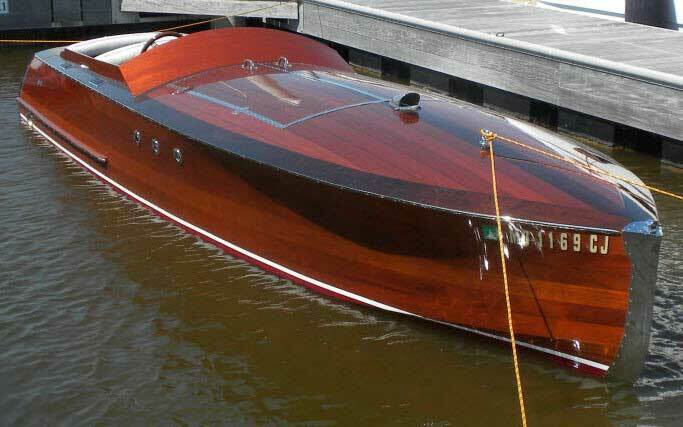 This boat shows more than most designs, however. She is curved from bow to stern, top to bottom. Her topsides curve as does her running surface. On a boat there are no square corners, like a house has. Although a craftsman can apply his talent to either type of project at hand, a craftsman who builds houses faces new challenges when building a boat. Boat curves need to be “fair.” The human eye can sight down the lines of a speedboat and see any lack of fairness in a given set of curves. Expert craftsmen judge each frame, batten, and plank as to its fairness literally hundreds of times each work day and in each step of the construction process. A boat must start out fair from the earliest step in the build and remain fair as each component advances from the start of the project to final finish. Bill Hood of Stevensville, MD, was recognized for his commitment to quality when Kidd received the Herb Zorn Award at the Antique and Classic Boat Society (ACBS) Boat Show held annually each June in St. Michaels, MD. This is a well-known, ACBS-judged show—the judges said it was the Best of Show for Craftsmanship. The Award is named after Herb Zorn who was a stickler for form and function in boats and a founding member of the Chesapeake Bay Chapter of the ACBS. Zorn is now deceased, but the award carries on in recognition of his zeal for top quality boat construction. Kidd is an outstanding example. Boats are built from plans. The plans show the complete boat design on a couple of sheets of paper and a few pages of notes from the designer. These lines and measurements need to be scaled up to full size to build the boat. This step is called “lofting.” All the important pieces are lofted as the first step to make a fair boat. Nelson Zimmer (1922 – 2007) designed, drafted the plans, and wrote the designer’s notes for this gentleman’s racer. The complete set of plans is available from The Wooden Boat Store in Brooklin, ME, for $120. Zimmer created his first boat design in 1931. He worked in John L Hacker’s office for three years after World War II. Zimmer used a second drafting table in an adjunct room to Hacker’s where he did his drafting work. Zimmer and Hacker did not design boats together or work on each other’s assignments. How much they shared with each other in the downtime of a given day is unknown. Kidd is the second wooden boat that Hood has built. His first was a 14-foot, 10-inch outboard powered runabout named Rascal. She weighs in at 790 pounds versus the 2400 pounds that Kidd weighs. Kidd’s construction is called a “cold-molded over sawn frames” wooden boat. West System epoxy is the glue that works with screws to hold the multiple layers of mahogany planking to the frames and battens. Cold-molded means that the epoxy glue changes to a solid in a room at normal temperature with a catalyst rather than heated in an oven to change from a liquid to a solid. West System is a popular brand of cold-molded epoxy. This boat is brightly finished in high-gloss varnish. She’s been re-varnished once since her original build date of 2012. Bill indicated that he likes the varnish’s ability to sand down and re-coat any snags or runs in the finish as he works. Kidd is a star that shines in the sun and rode like a dream on my sea trial on the Wye River. Ask for a ride if you see Hood and Kidd at an in-the-water classic boat show such as the St. Michaels Antique and Classic Boat Festival in June.